helpful nice staff. clean room. comfy bed. great shower. good breakfast. free parking. close to amenities. We found that the hotel is good value for the money. It is very convenient being located downtown and has an underground parking. The location was perfect. The hotel has got it's own car park as well but there's a cheap pay and display opposite as well. The welcome was very good, friendly and efficient. Easy access to hotel, secure underground car park; comfortable bed, quiet room and very good breakfast. Excellent place- clean, new and pleasant, only couple of minutes walk rom town centre with good bars and restaurants. We were on motorbikes- hotel easy to find with satnav and parking directly underneath. Polite helpful staff and good breakfast too. Family room had very basic facilities (curtain for bathroom privacy), but was comfortable and clean. Not particularly cheap either, but the only room I could get for 2 adults and 2 children in the area. Very comfy and clean rooms. A very nice hotel, immaculately looked after and very helpful welcoming staff. 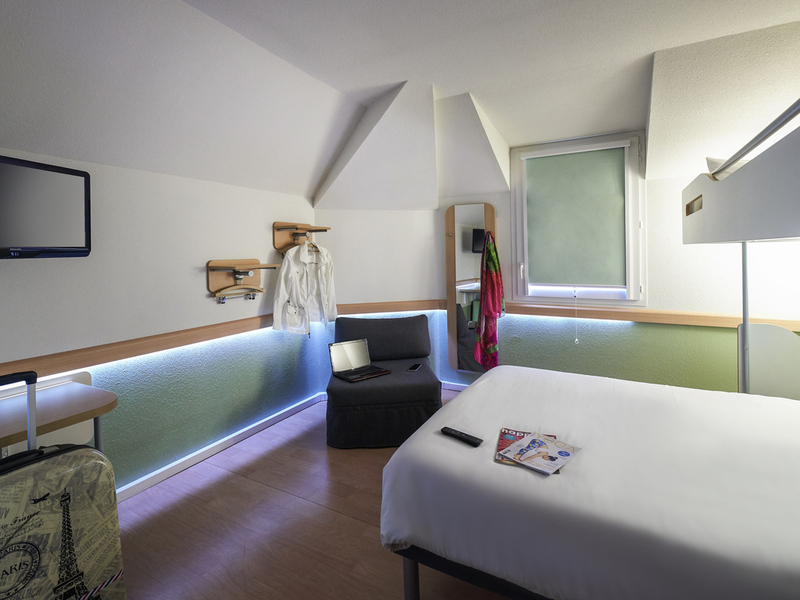 We had a great stay at the Ibis budget hotel in Cholet. The stuff was very friendly and helpful. The room was good and the bed comfortable. I can only recommend this hotel as the location is right in the center of town and walking distance to the main square where all the restaurants are located. service was good and the beds reasonably comfortable. Can recommend it for the location and helpfulness. Breakfast was very good and absolutely sufficient. Lift worked well and parking was easy. You won't regret your booking. Car park very hard to find in the one way system - took me 1 hour 10 minutes & it's right behind the hotel but underground & you have to put a code in - this took 6 attempts before it would work. Breakfast was satisfactory but I was the only person the Man asked for my room no. To prove I was registered there - not for any other reason. Room clean, bed comfortable.